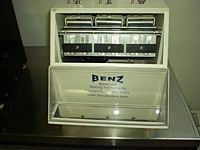 The Benz Model DFT and DFT 2100 flexing fatigue testers are 20 station instruments designed to test the resistance to crack growth after repeated flexing. The instrument is capable of testing up to ten million cycles. The minimum cycle travel is 1/2 inch, to a maximum of 4 inches. The standard speed of the instrument is 300 cycles per minute. There is an option for adjustable speed, with a range from 0 to 500 cycles per minute. 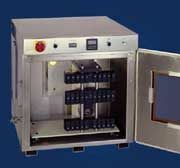 A chamber to test at elevated and depressed temperatures is also available.